Just a quick note before I head out the door to work. 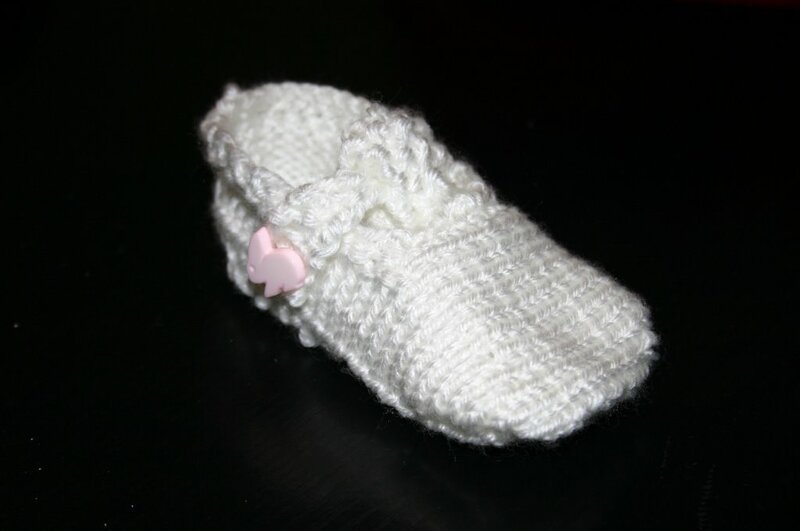 I finished one of the Simple t-bar shoes last night while watching "Titanic"(ofcourse I bawled again, I'm such a sap). They are very simple (the pattern does not lie) and are a very quick knit too. I should be done the other one by tonight! These shoes are just too cute. I'm all back up to par with my knitting thanks again to Rhonda, wooot woot!!! Last night when we got home from their place I got right to the 2nd sleeve of the baby sweater. Now all I have to do is the last decrease and I'm ready to start my garter. I think it's safe to say that it will be done today, thank goodness! I also am sure that I will have just enough yarn left to make the rest of the sleeve, pheeew sure cutting it close though. I didn't have much to report this week, but I'm glad everything's wonderful again and I'm getting stuff done now. Update!!! I saved this post as a draft and didn't publish it, but it's Monday now and I'm done the sweater! My only beef with the sweater is that it seems to have a small stain on the left side. I've washed it by hand with a samll amount of laundry soap, but it's still there. Anyone got any other suggestions?? 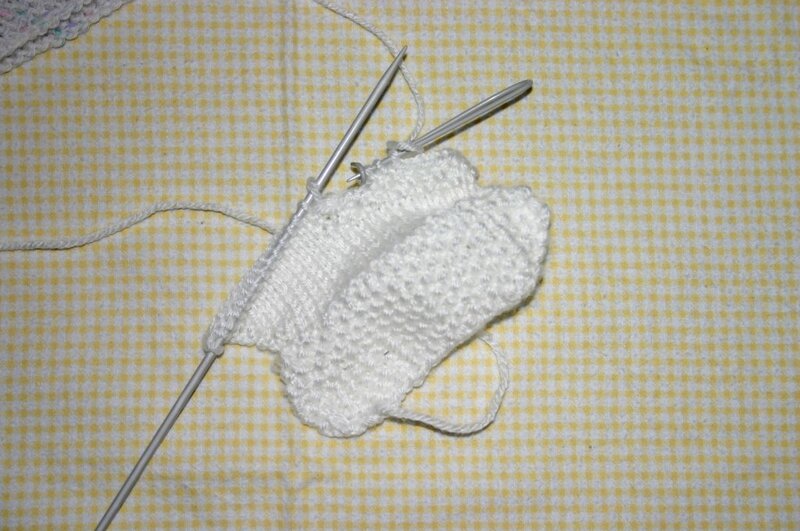 I'm also cooking with gas on the scarff and I've started the simple t-bar baby shoes, which look so adorable! I'm already half done one of the sho es already so they won't take long. 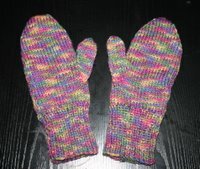 Samantha has a finished pair on flickr that you can check out. They really are adorable. Well, this is probably my last post for the month of January, man time's flying by fast! It just doesn't seem like winter with the weather being so mild, but I can't complain because Paisley and I had fun at the park again today! I'm going blond(ish) at least for a few days! Tonight my neighbour and I had a lady's night. She came over and bleached my hair. I dyed my hair black in the summer and just wanted it out because there's a colour I really want t o dye it called ginger spice or something like that, it's a reddish copper brown...really pretty but there was no way I was going to achieve that with out a bleaching first. I know what you're thinking, SO horrible for your hair, but this is only the second time in my life I've put a bleach in so I though what the heck. While we were waiting for my hair to develop, I gave her a knitting lesson. She's been bugging me since the summer for one because she got all these knitting needles from her mother-in-law and thought she might as well do something with them. We just did the basics, casting on and straight knitting for now. I worked on my practice sock for the Olympics while she played around with the knitting. It doesn't seem to be too hard yet. The only thing I find is that I'm using metal needles and they feel really heavy when you're doing a project on 3 needles. 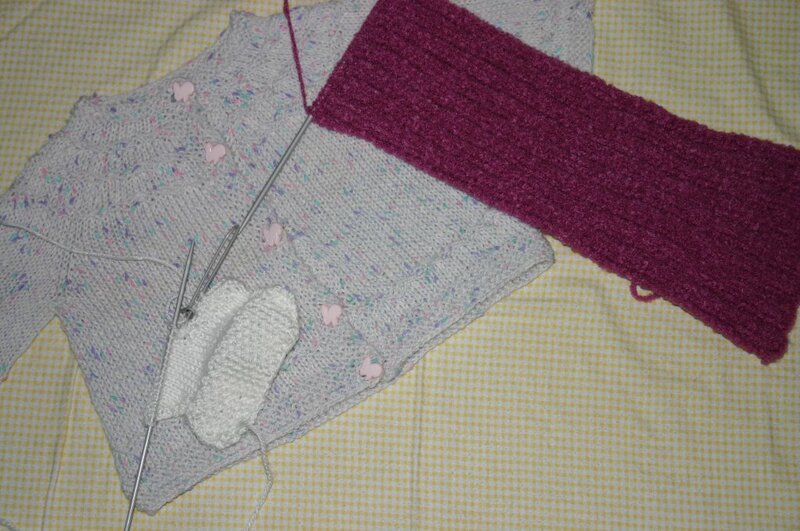 I'm using acrylic needles for the sleeve of the baby sweater and I like the feel of them much better. Perhaps down the road I will be investing in some nice light dpn's because I really enjoy working on 3 needles for some reason. That's it for me, I'm off to bed! I'm sure you all have been stuck in rush hour traffic. It's stop and go all the way there and it seems like you're never going to make it to your destination then there's a break in traffic and you're cruising happily along again and suddenly BOOM, it's all backed up. I guess the point I'm trying to make is that I seem to be forever stuck on the one sleeve of my seamless baby sweater, even though I'm making progress I can't seem to get the damn thing finished. Last week I finally picked up a set of dpn and I was going to attempt to knit on 3 needles. As I may have mentioned in a previous post I botched the sleeve when I knit it all onto 2 needles not realizing that you actually needed 4. I've never been great at fixing my mistakes, it's an important skill that I lack and hope to one day master. I can rip it back, but as soon as I drop any stitch es I'm completely lost. So, I waited all week for the weekend and consulted my mother-in-law Rhonda for help. I will say that before I get her to help me, I always try to fix it myself first...Unfortunately I usually end up screwing it up more. After our visit on Saturday, I took it home all excited that I could finally finish a sleeve and I got to the decorative row, threw it in and then after it was finished I realized that I should've purled instead, bahhh! So I ripped it out all by myself and started again but then something in the pattern didn't come out right. I waited for Rhonda to bring Paisley back Sunday night for more help, Arrrgg. Paisley and her finally arrived and she set me straight again. I guess I picked up an extra stitch some how on each needle when I was purling my decorative row in. Now, I'm really hoping Sunday night's the night that I'm going to get my first sleeve done. Knitting on 3 needles wasn't really too hard at all. I'm now down to the knitty gritty (pun intended)...and I've started my garter rows and everything's perfect except that I forgot to do my decreasing on the last stockinet stitch row. Fudge! I stared to go back again to my last row of ss so I could do the decreasing when all of a sudden all of the stitches slipped off one of the other needles. I tried to pick them all up, but now it's all bunged up and ofcourse....Now I need help yet again. To top it all off...I'm pretty sure that I won't have enough of the yarn to finish the project, but we'll see...it's going to be cutting it pretty close though. It was another wonderful day in Southern Ontario. Paisley and I took advantage of it and went to the park then stopped over to the Library. Paisley had a blast there. They have a little play corner at the library with all kinds of toys, games and puzzles. There was also a little play kitchen fully equipped with sink, stove and dishes (teapot & all), so while I sat and watched her play, she made me about 10 cups of tea and kept asking me (it was so cute) "Do you want a cuppatea Mama?" She was quite the little hostess, also making me eggs, mashed potatoes and cookies. We were probably there for about an hour playing. I think she was more interested in playing rather than picking out books. We ended up choosing a few books and some DVD's to watch at home. I think I watched "The Big Comfy Couch" video about 3 times today. Something that I thought was funny was that we also borrowed a "Strawberry the Shortcake" DVD and when you open it up (in traditional Strawberry the Shortcake style) it smells like strawberry goodness. I couldn't believe that they actually scented the inside of a DVD case! More of these pictures to come! First time being tagged by Samantha! 4 Jobs you have had in your life -- My first job was at a camera store in Owen Sound, ON. It started as a co-op through highschool. I miss that place. :-) I've also worked at HMV and assisted a photographer when I lived in Toronto and currently I'm working at Shopper's Drugmart. 4 Movies you could watch over and over --Empire Records, Practical Magic, Almost Famous and 13 going on 30 (I thought that movie was so cute). 4 Places you have lived --Owen Sound, (I grew up there), Toronto, Etobicoke and Hamilton all here in Ontario. 4 TV Shows you love to watch -- Rock Star INXS (when it was on), now there's not much worthy of watching. (Because of Paisley) I watch alot of children's programming though Dora the Explorer, Big Comfy Couch, Blue's Clues, etc. 4 Websites you visit daily -- The Weather Network, Blogs ofcoure, My banking and google (always gotta google something). 4 of your favourite foods -- Spaghetti (well almost anything pasta), chicken (cooked anyway), chocolate and this is sad, lol, but Wendy's Spicy Chicken Sandwich...I think I could eat that everyday if it wouldn't make me pack on the pounds and eventually give me a heartattack. 4 Places you would rather be right now -- Sleeping (worked until 12am last night), somewhere tropical and warm, shopping and cozy on the couch knitting. 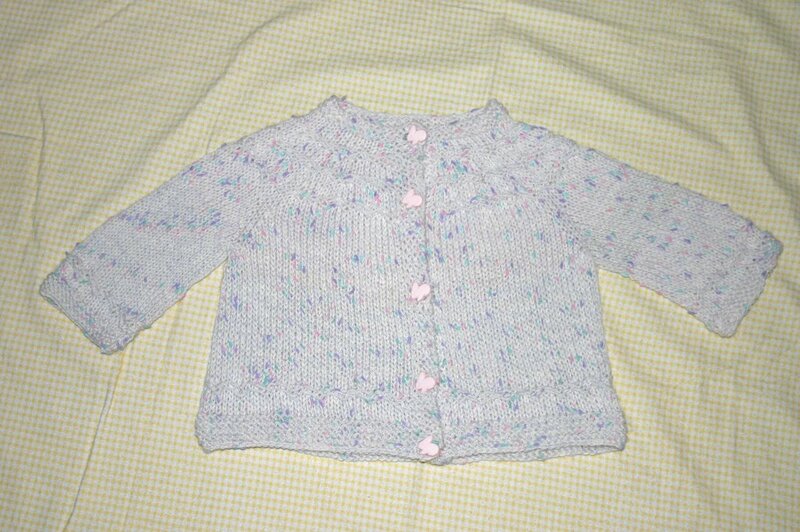 The last few days have been devoted to getting the baby sweater finished. 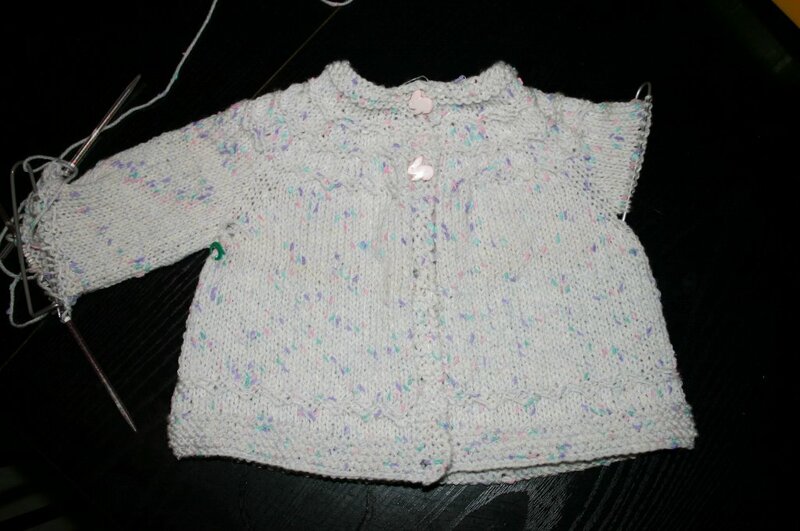 Between, working, housework and playtime with Paisley I've managed to finish the body of the sweater. I some dropped a stitch some how during my bind off, so I just have to go back and fix that but other than that I'm done and ready to start the sleeves. Since I've never knit with dpn's before (minus i-cords) I thought I'd give it a whirl. I got all my stitches off the stitch holder and picked up the 4 stitches that had to be added in the armpit and divided them as evenly as possible on the 3 needles. I thought this would be good practice as I entered myself in the Yarn Harlot's Knitting Olympics to try and make a pair of socks. So now all my stitches are onto the needles I begin to add in my yarn to knit. Anyway, I'm knitting along thinking that I've got it and I get to the the last stitch on the first needle and then all of a sudden my stitches are only on 2 needles instead of the original 3. That's when I put it down and sought out some help. I went to knitting help.com and watched a video tutorial on knitting with dpn's only to find out that you actually have to use 4 (or sometimes maybe even 5)needles. This actually kind of made me laugh because dpn's come with 4 needles, I should've have maybe put 2 and 2 together. Oh well, I guess you've gotta start somewhere! 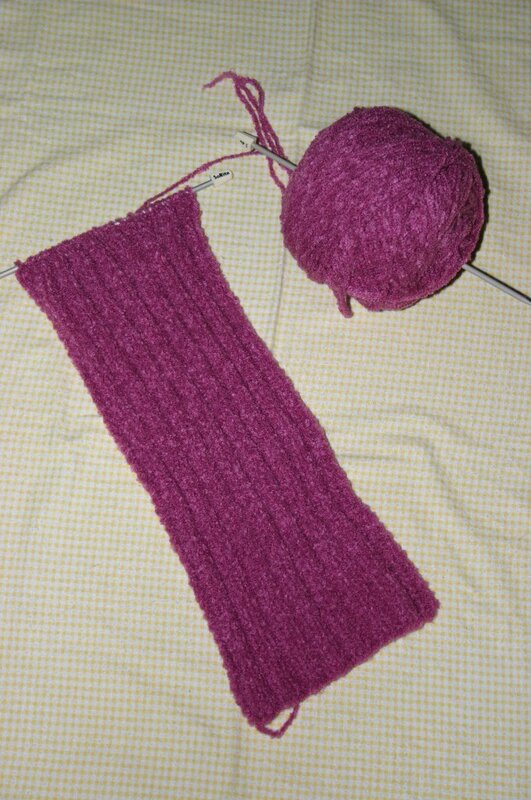 For now, my knitting is back in the bag until I get a chance to start the sleeves over again. Last night I finally got to pick my knitting back up again, I stayed up quite late trying to make a little more progress and then before I knew it, is I was making WICKED progress! I got the sleeves on their respective stitch holders and I am now working my way down the back of t he sweater. The only thing I noticed on the pattern was that it wasn't really clear on the length of the back. Is it just up to whenever we feel that it is long enough or am I just not reading it quite right? Does anyone who has done this sweater know? It's the Seamless Yoked Baby Sweater. I don't imagine it's going to take me that long to finish it now, I'm so excited! Next task is to get a set of 4mm dpn because I don't have any. This pattern is extremely easy and straight forward, so if anyone is looking for a quick baby gift...this would be it! I'm very happy with it so far. 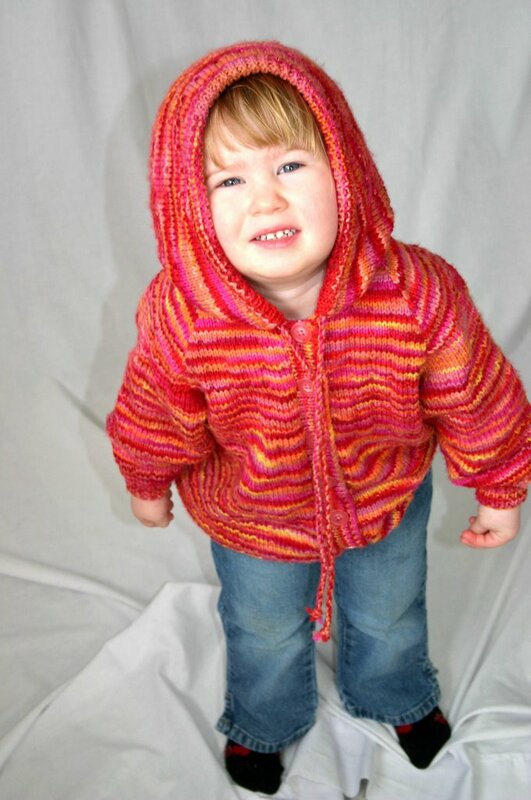 Paisley also got a beautiful new raglan hoodie that Gramma finished for her. It was so awesome that we had to do a little photo shoot to display her work and the beautiful babe behind it. Paisley loves this sweater, she's been wearing it since she got it on Saturday (minus bath & bedtime)it due for a wash anytime now. She keeps saying that Gramma made it for her and she "lubs Gramma" just too cute! My parent's stopped by Sunday afternoon and as always, my mother loved the new knit! My Mom never got into the knitting so I think she's impressed that I've even picked up a pair of needles. I am driven by such lovely inspiration (Rhonda), she always makes the most amazing things(as you can see from above). After a year or so of watching her and all the cool things she had made I wanted to knit too so I got her to show me and I've been knitting for about 2 years now. I am so lucky to have such a great mentor/teacher and I hope that one day I'll be an "expert knitter" like her. And I gotta go now (what a sweet way to end things), Paisley just got into the fridge and cracked 5 eggs all over the kitchen. Mannn, I want to swear violently right now. Damn terrible twos! My title is currently being worked on, just wanted to apologize for it being so tiny right now! Nothing exciting to post(not having a great week), making some progress on the baby sweater...not as much as I would like but it's all good, I'll just take my time at it. Hopefully on Monday I will have alot more of it finished and ready to report (I'm being optimistic that I won't have too many interruptions, probably wishful thinking)! 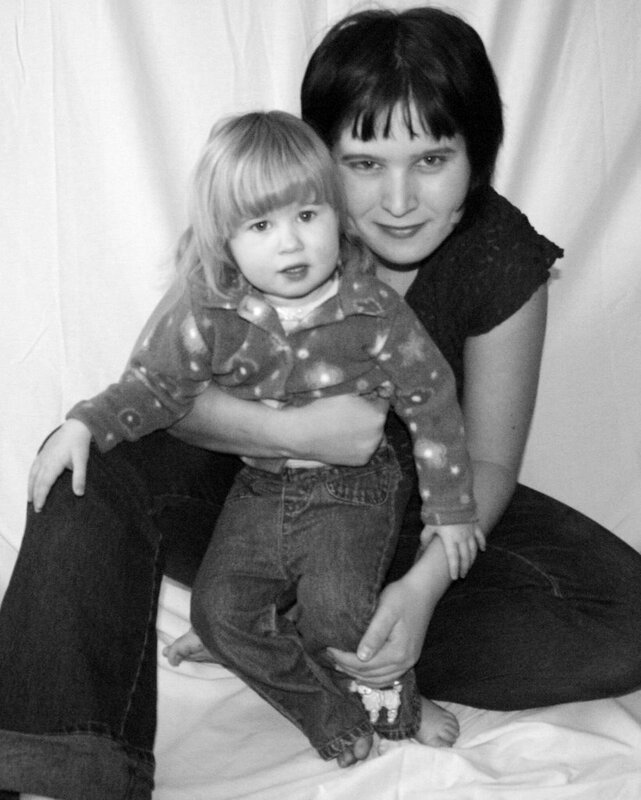 I'll end this with my favourite picture of Paisley & I (gotta spruce up this post some how). Between keeping up with house work(I slacked last week) and Paisley, it seems to be hard to fit knitting into my schedule this week. I tried to work on my ribbed scarf a few times, we had a little situation with the ball of yarn yet again and now it's on hold until we get it into a ball of yarn again. You should see this ball of yarn, it's really quite scary looking. The A'more is almost chenille like in feel and it tangles together really easy. Sometimes I think all the balls of yarn in the world are out to get me because it seems like everytime I start with a new ball we have a "situation". This time both ends came out together and tangled into a bad mess. 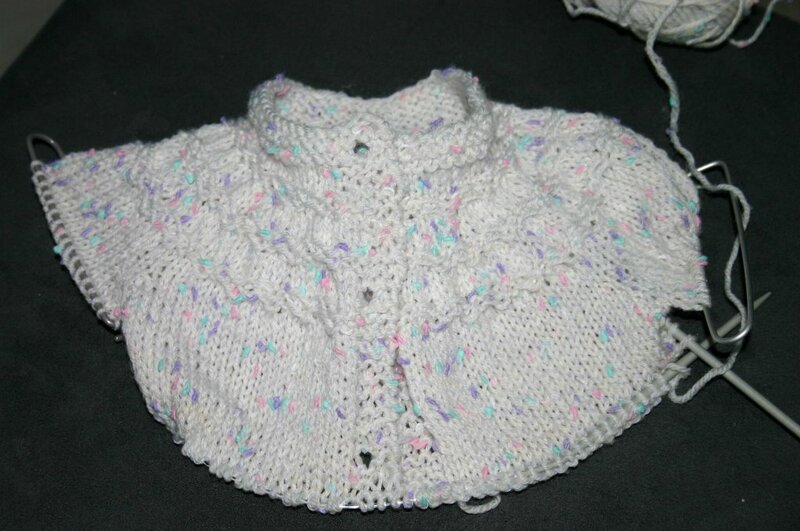 On Samantha's blog I saw her finished Seamless Yoked Baby Sweater, I also check out the pattern and it seemed pretty straight forward. Right away I ran up to my knitting stash to see if I had the specified yarn for the pattern, sure enough I found 2 50g ball of magic garden Buttons dk yarn and thought to myself, just perfect. It's white with little specks of pink, green and purple. It's already looking cute and I haven't even knit up that much of it yet. It's for a little baby girl due in February, so hopefully I have it finished reeeealllly soon! It actually seems to knit up pretty fast so I don't see it being a problem, although I do have a slight problem right now...my kitten Deuce attacked my circular need and chewed it. Now it's not smooth and my knitting catches on it. I've tried mending it myself with a nail file, but it doesn't seem like it's done any good. I guess tomorrow's caper will be to go and buy a new 4mm circular needle so I can get this sweater done. Ahhh, the joys of having cats! Wow, I've just found the best pencil crayons in the world for a 2 year old!! At work (Shoppers Drug Mart) we're having this massive Christmas sale because too much Christmas stock was ordered. Through all my sorting and searching through merchandise I came across these pencil crayons, they're called Magic Artist by Bic. 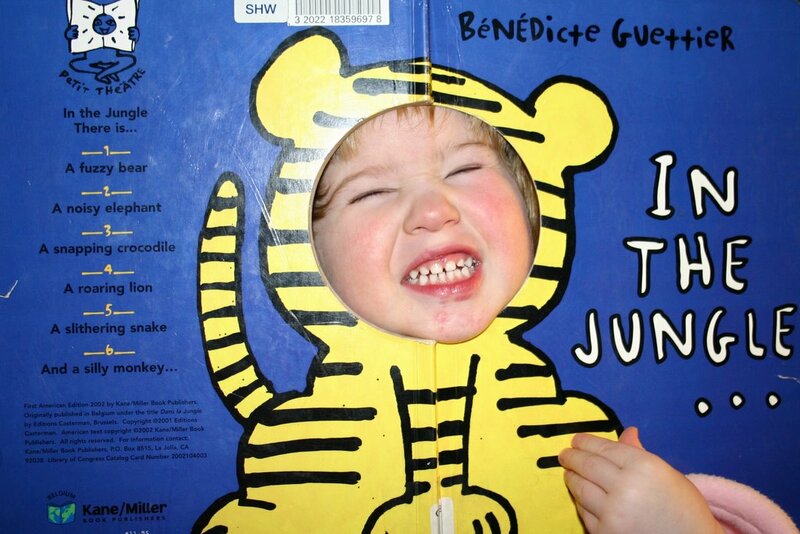 (nicely decorated with Winnie the Pooh). I kind of checked them out, on the back read "Wood-free resin pencil. Ultra shock resistant lead." I thought to myself, hummm maybe they won't break like all of her other crayons in her pencil case I'll give 'em a whirl (plus I couldn't beat the price marked down to a whole whopping .99 cents). Today we tried them out and voila not a single one of the 12 crayons broke and Paisley's rough when she's colouring. They were dropped on the floor several times to boot. I must say....I am quite impressed! Well, I gotta go clean up a huge cereal mess on the table, she just dumped her bowl of Apple-cinnimon cheerios. I haven't had much progression with any knitting either, so nothing exciting to report except that I'm not doing the Irish hiking scarf on the same yarn anymore, it just ticked me off on the TLC A'more (I ripped it out about 5 times). So hopefully this week I'm going to look into getting something different to make it with. While Paisley is completely glued to "Elmo's World", I thought I'd type a quick post while I had the chance! Firstly, I would like to send props out to Samantha for plugging my blog! Like I've already mentioned to her, if I some how become famous, I'm keeping her in mind for my PR person. After ripping it out 3 times and slight technical difficulties with the ball of yarn, I have decided to make the Irish Hiking Scarf my next project. I started on 5.5mm needles but I've change my mind and am now doing it on 4mm needles. With the type of yarn that I'm using (Red Heart's TLC A'more) you just couldn't see the pattern that great with the larger needles, it just blended in with the ribbing too much and you couldn't see the beautiful cables. It seems like an easy enough pattern so I don't anticipate taking all that long to knit. I'm just anxious to see how it's going to look as the cable pattern progresses. Today Paisley was pulling stuff left and right out of her closet, creating quite a mess for me to clean up. 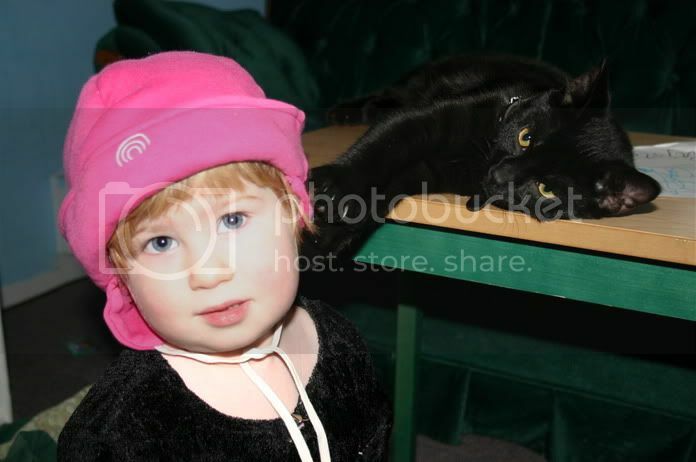 As she was digging through things she found this little pink hat with the earflaps (which she will not take off now for some odd reason). She keeps calling it her "Hockey Hat" because we got my brother one of those "Hat Trick Hats" for Christmas (incase anyone is not familiar with these hats, they look like hockey helmets). So now she's all in her glory because she has hat like Uncle Chris' (whom she adores). It's so funny because Ron & I are not really into hockey at all, but she loves it. She has a few old hockey cards that she keeps around to look at, if she sees it on TV she gets all excited and she always wants to skate (even though she's never skated before) and also go watch Uncle Chris play hockey (he's a goaltender). A little girl after her Uncle's hear I guess. The last two days have been nothing but crap weather. Today being the second day of really doing nothing at all(taking a small break from the knitting) I decided to stay in my pyjamas all day (how sad...I know). The least I could do was be a good mommy get Paisley dressed up. She's been a handful the last two days because she hasn't been able to get out and burn off all that penned up energy. It was a day of "NO's" and "GET OUT OF THAT" and me being super irritated but we made it through and ended up running out to Shoppers to get milk and a frozen pizza around 6pm-the craziest part is that I actually went out in my pyjamas...a first for me. Okay, my social outlet for the day, I'm sitting here typing away my frustration. I was never much of keeping a diary, or writting for that matter, but I really am enjoying this blog thing...between blogging, knitting and having my hands full here at home, it really shouldn't be a problem this winter from becoming lethargic. On a positive note, my neighbor dropped off a bunch of little girls clothes for Paisley again. We had a blast going through them because Paisley had to try all of them on. There was about 7 or 8 pairs of little flared jeans, all too adorable. I guess this means that I have to make the little girl next door a sweater. 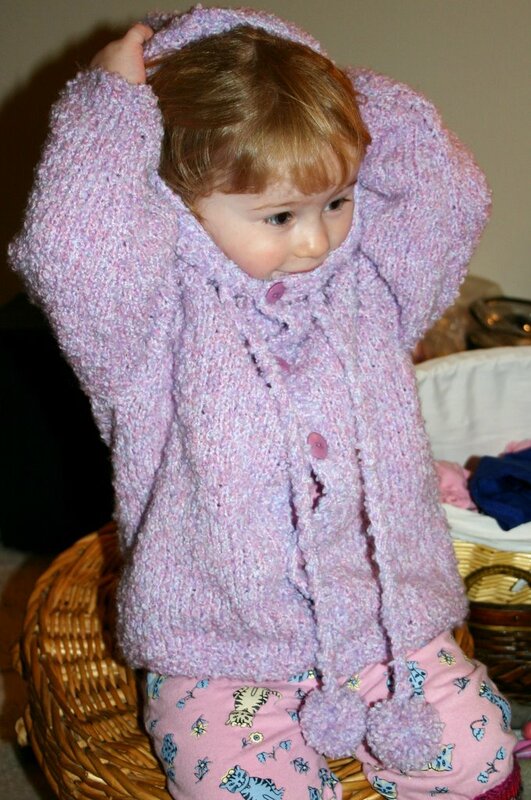 In the summer I made that raglan hoodie that I posted yesterday (Paisley's modeling it for me) for a little girl we received a tonne of clothes from. 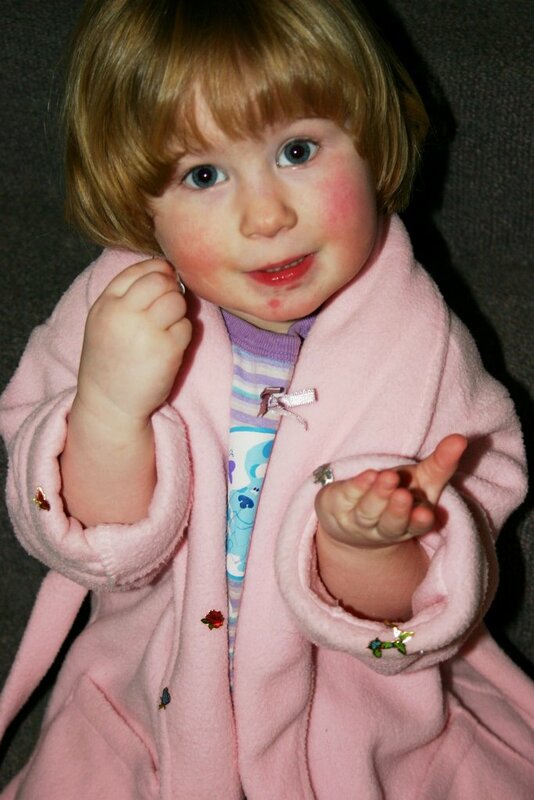 I was actually thinking of when I was little and how much I loved getting hand-me-downs. I was maybe 8 years old, not 2. It made me laugh how excited Paisley was over all of this. I also finally got my binder of knitting patterns together and now I'm finding there is actually a use for dividers. 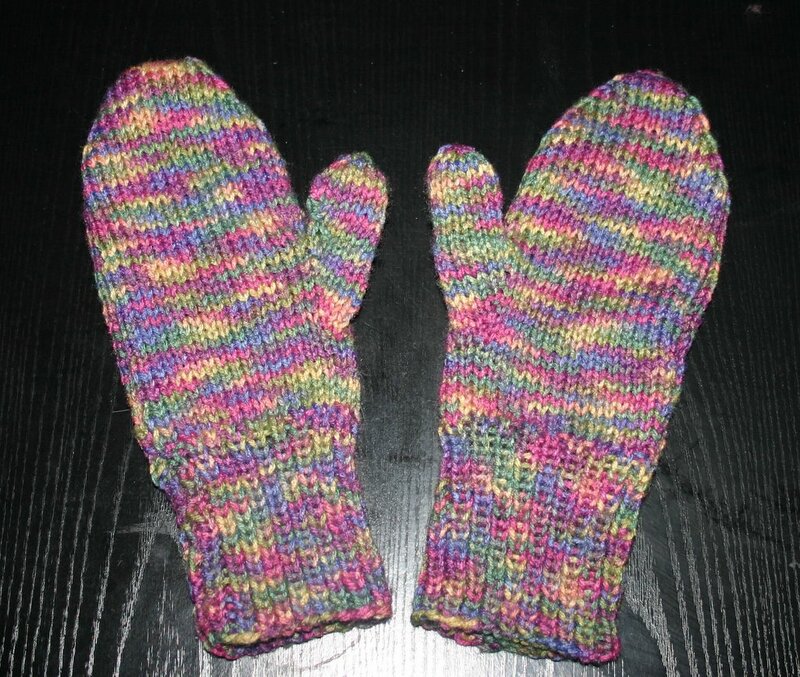 Just a few more pairs of mitts I have done for Christmas 2005. 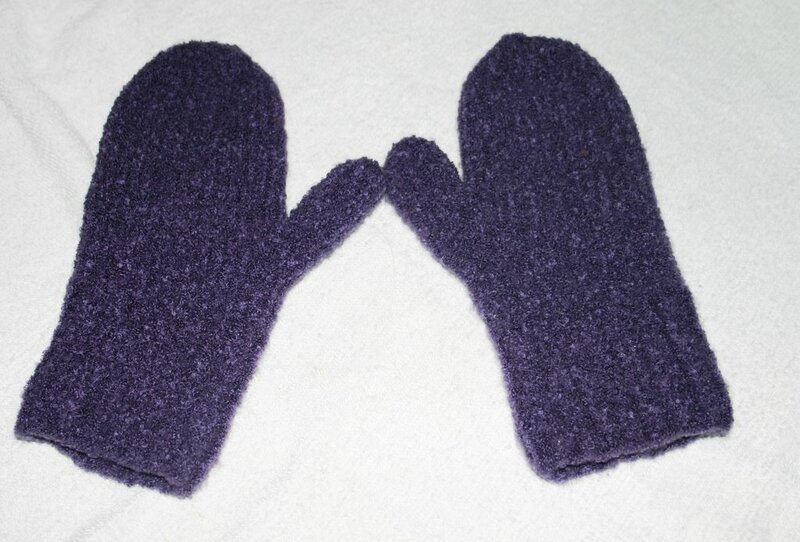 I always use the Patons Canadiana Mitt pattern for my mitts. I'm just really comfortable with that pattern. I'm so lucky I have such a beautiful model to display my work (when she co-operates). 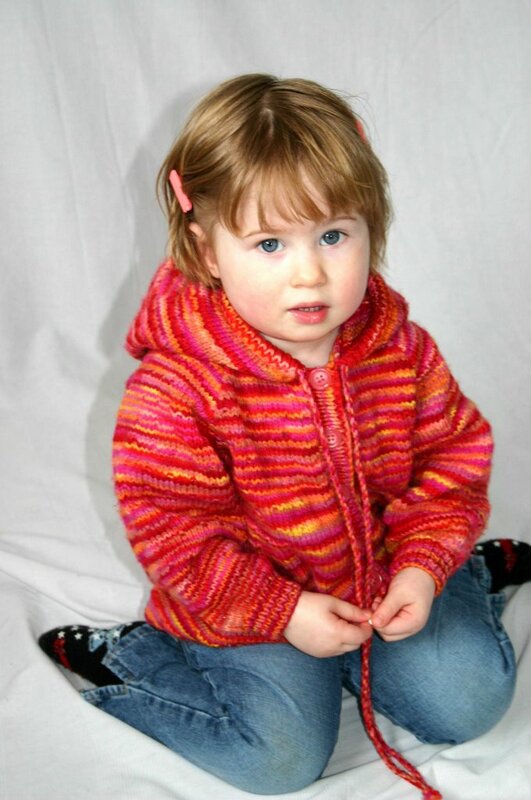 :-) This cute raglan hoodie was my summer project! With all my knitting, we had to put Paisley to work! 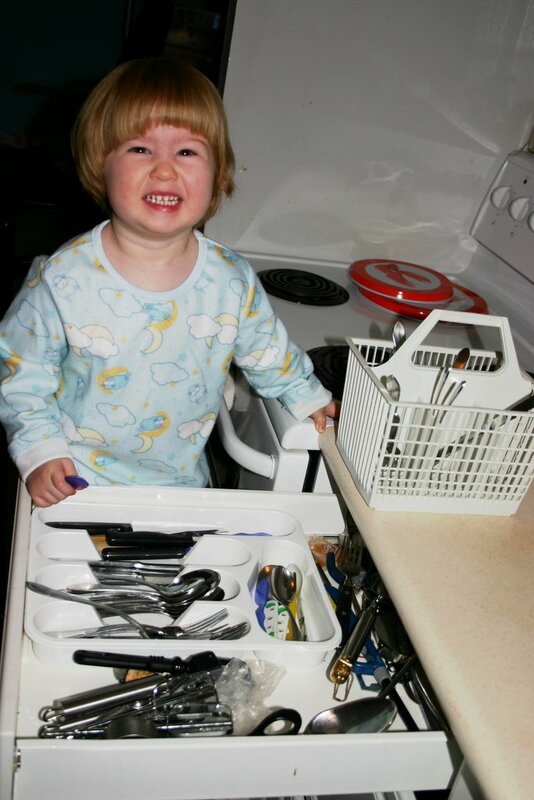 Just kidding, she just loves to help out around the house (and I have to put pictures of her in here somewhere). A new bag for a new year! Santa was nice enough to give me a knitting kit for Christmas this year. It was a "Black Sheep Bags-Booga Bag Pattern" Kit. I was determined to get it done fast so I could show it off and I also couldn't wait to felt it, I love felting! It took me a day and a half (10mm needles) to finish it off and it dried super quick, I got to take it shopping the same day. 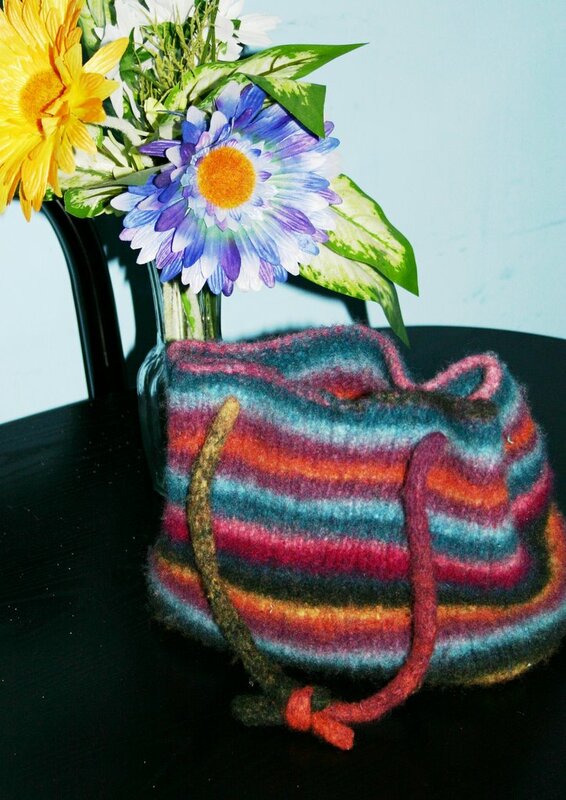 The colours in this bag are just amazing and imagine that, I didn't even have to do stripes, the yarn did it for me. The only thing I found was that my i-cords just weren't long enough, straps are a tad short. I'm all out of the Noro Kureyon yarn that was used to make the bag, but I'm sure I can figure something out. I wanted a bag that was just big enough to throw a diaper or two, some wipes, a sippy cup, my wallet and keys and this does just the trick.